From its name you might think it’s a type of tomato. It certainly looks a lot like one, once its husk is peeled away. 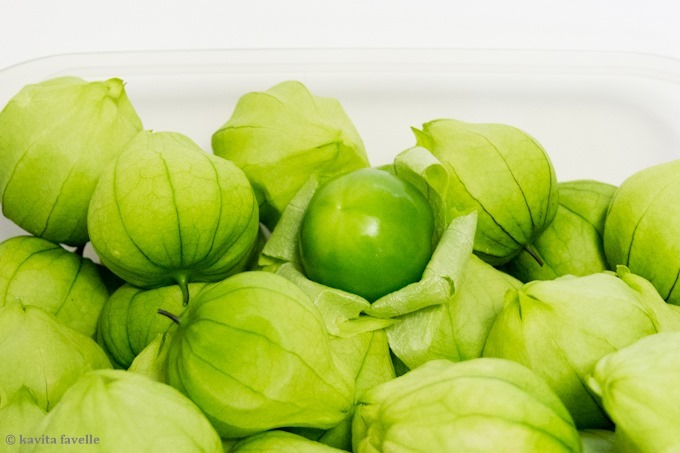 In fact, although the tomatillo is a member of the expansive nightshade family (which includes tomatoes as well as potatoes, aubergines, chillis and peppers), it actually falls within the physalis genus, making it more closely related to the cape gooseberry. Like the cape gooseberry, the tomatillo is a smooth-skinned round fruit enveloped in a delicate, paper-thin, lantern-shaped husk. Green and pliant on the plant, once picked the husk starts to dry out, turning brown and brittle; the greener the husk, the more freshly picked the tomatillo. 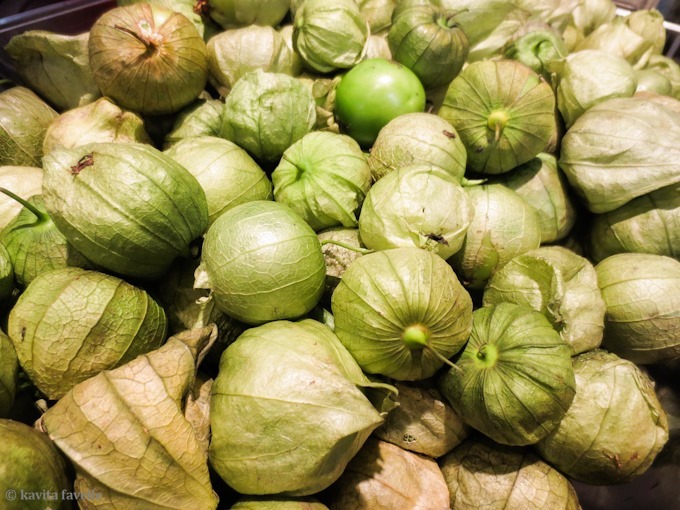 Both cape gooseberries and tomatillos hark originally from Central and South America and, indeed, tomatillos are a staple ingredient in Mexican cuisine. They are eaten fried, grilled or boiled in many different preparations and are a core ingredient of salsa verde. Ripe tomatillo fruits can range from yellow to red and purple but green is the most common colour, making them look even more like unripe tomatoes. The similarity of their names is no coincidence; both words come from Nahuatl, the language of the Aztecs, with tomatillos originally being known as tomātl (fat water) and tomatoes as xitomatl (fat water with navel). When the Spaniards exported the tomato to the rest of the world, they took with them the name tomate. But unlike the tomato, the tomatillo has not yet become a common global ingredient. Although imported Mexican fresh tomatillos are sometimes available in Europe, it has often been easier to find the fruit in tinned form. However, in recent years, specialist farmers have started to grow tomatillos here in the UK. Edible Ornamentals, a chilli specialist in Bedfordshire, is the largest tomatillo grower in the UK and sells the fruit commercially. Owners Shawn and Joanna Plumb once lived in San Antonio, Texas, where they became very familiar with tomatillos along with many varieties of chilli. Mexican cooking is very popular in Texas. Joanna is an enormous fan of tomatillos, explaining that “the flavour is like nothing I have ever tasted. It is a cross between a tomato, a cucumber and a water melon. Very refreshing.” Although she loves eating the fruits straight off the plant, she also enjoys them in a traditional green salsa. Of course, one sure-fireway of getting your hands on fresh tomatillos is to grow them yourself. “Tomatillos grow like triffids,” warns Joanna, and recommends training them up a vertical support so they don’t take over your garden. You will need at least two plants as they pollinate each other. 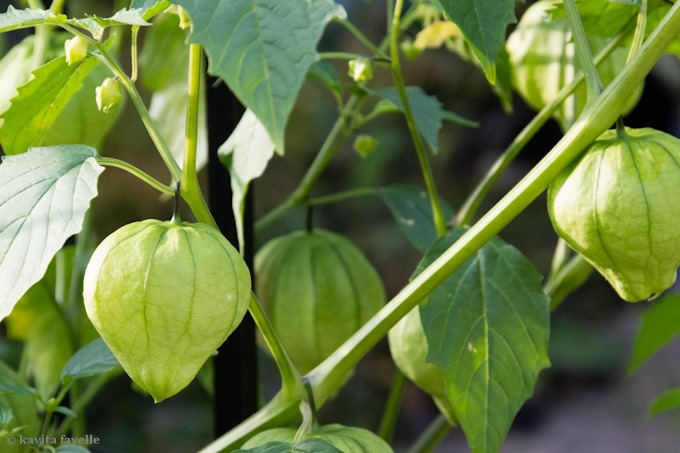 Keen gardeners can buy tomatillo plants directly from Edible Ornamentals’ nursery in Chawston, Bedfordshire and visiting the farm also offers the opportunity of a chilli tour and Pick Your Own. You can also grow from seed – available from a number of seed catalogue companies. Tomatillos usually start fruiting in July or August and, if you grow them in a greenhouse or polytunnel, continue until the frost comes along. If you are able to find fresh tomatillos, the good news is that they last for a couple of weeks in the fridge; up to twice that if the husks are removed. They can also be frozen, whole or chopped. And, of course, you can cook them and preserve in jars. It’s worth noting that tomatillos have a high pectin content, making them a great ingredient to add to jams and chutneys. Place tomatillos, onion, garlic, and Serrano chilli into a bowl. Season with coriander, oregano, cumin and salt. Leave for about 30 minutes and then serve. Can be used as a side dish, in fajitas or as a dip for tortilla chips. You may also be interested in Joanna’s chilli growing tips, which she shared with us during our visit. This piece was written in 2014 and first published in Good Things magazine. ©Kavita Favelle. 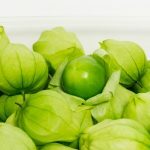 31 Comments to "A Taste For… Tomatillo | Green Tomatillo Salsa"
I’ve just seen Sejal’s comment about finding them in two places in North London recently, so looks like they are becoming a little easier to find, in London at least. I love tomatillos, I think Mexican food isn’t complete without them. They used to be almost impossible to find here, but I’ve recently bought them from two places in north-west London, near my house: West Hampstead farmers market, and Panzer’s deli in St John’s Wood. That’s great to know! When I wrote this piece a couple of years ago, they were not easy to find fresh here, though Edible Ornamentals had been growing them for wholesale buyers for a while, and were also selling them fresh to customers who visited the farm. They sell seedlings too. It’s good to know these are now becoming available in specialist vendors in London. I love tomatillos! Though I’ve never actually had fresh…only ever from a can 🙁 hazard of living in the UK I guess. This salsa sounds fab. Yes I think canned was all that was readily available here for a long time! I first came across these a couple of years ago at a farmers market and had no idea what they were. Bought them anyway and made a fab salsa. Ha haaaa, that’s rather magnificent! Psychic Kavey!!! Hope you can find some to try Camilla, I think you’d have fun experimenting. They’re good for jams / chutneys too! I am so salsa obsessed and love salsa verdes! So delish! I don’t make it often enough, always forget until I’m reminded by a gorgeous colourful photo! They grow really well. Both the green photos above are our homegrown ones, on the plant and just harvested. The brown ones are in a restaurant kitchen. You can buy seedlings from Edible Ornamentals, though there may be other sellers of seedlings or seeds. Yeeeeeees they do change it completely from tomatoes! They do grow very well here so worth asking! Been growing them for years now. They grow well in the UK. Had a recipe for tomatillo salsa in my 2011 book Supper Club. You can also roast the tomatillos for salsa asada. Yes I’ve roasted for salsa before. We grew them a few years ago, the two green photos above are our homegrown on the plant and just harvested. I have heard of tomatillos – and had salsa made with them abroad – but didn’t know you could get them here in the UK now! That’s wonderful news as your salsa looks absolutely delicious! I hope to make it soon. Thanks April, they’re not easy to find everywhere yet but getting there! Riverford has tomatillos now! Give it a few weeks and they usually do a salsa box with coriander, garlic (a couple if heads), lime and red onions – it always works out less than buying the ingredients separately, although maybe not less than non-organic. This recipe is so easy! I love it. Sometimes I grow my own tomatillos. None for me this year, but I can’t wait to start! You are playing into my wheelhouse with this Mexican salsa. 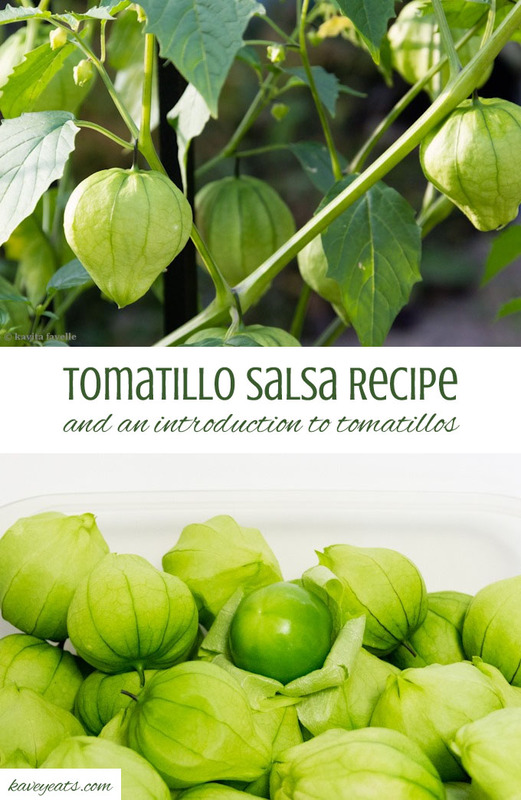 Thx for sharing the insight into the tomatillos. I learned something new. This is a great recipe. I love the addition of coriander powder and cumin powder in this salsa.. Thanks Divya, Joanna is a real expert!